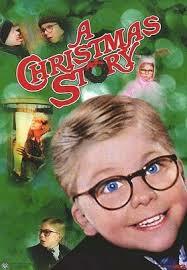 Movie # 3 is… “You’ll shoot your eye out kid…” A Christmas Story! I remember seeing this film in the theaters when I was like 10 years old. I loved it then and still love it now. Shockingly enough, the critics panned this film. They complained that it didn’t have a strong plot and was just a bunch of funny scenes pasted together. Well, they were right about one thing. The late Bob Clark directed “A Christmas Story” and what he did was take a bunch of stories he loved to read when he was a kid and made a movie out of them. But where the critics were wrong was calling it a bad film. This film is nothing short of genius. It goes to show the critics don’t know everything because “A Christmas Story” would instantly become a Christmas classic favorite. It’s totally original and people ate it up right from the get go. From the scene with the Mom telling her son to eat like a little piggy to the angry elf with the belligerent Santa, this film shocked the viewer with a different look at Christmas, through a child’s eyes in the 1940s. This film will make you barrel over with laughter and make your heart melt as you watch Ralphie try to get his Official Red Rider BB Gun. Every scene in this film keeps you glued to the screen. “A Christmas Story” is the king of Christmas classics and you can catch it on TNT from 8 O’clock Christmas Eve to 8 O’clock Christmas night. That’s right, TNT plays it for 24 hours and 1/3 of the country tunes in every year at some point on Christmas to watch this film. I actually put it on when I go to bed and wake up with it on Christmas morning. I know, I know, I’m obsessed, but I really do love this film. “A Christmas Story” is the most popular marathon on television today; “The Twilight Zone” marathon comes in at a very close second. Bob Clark said in an interview that he was sitting in a diner during the Christmas season and he could hear the family, in the booth behind him, reciting his film line by line from beginning to end. What do the critics have to say about that? Is anyone reciting his or her reviews line by line? I doubt it. Now, as a filmmaker myself, I feel that is the biggest compliment you can get when it comes to your film. To become a cult classic is also a huge honor, but to become a Christmas cult classic, well that’s the cream of the crop. If you haven’t seen this film then you are missing out big time, especially if you love the Holiday season. What are you waiting for? If you’re waiting for Christmas, it’s here, so see it! Put it on your watch list Christmas Eve. This is a perfect film to watch before you go to bed and get ready for Santa to visit. It is hilarious, super interesting and great for the whole family. So we follow a desperate Ralphie and his quirky family in the 1940’s as he tries to find some way to get the present he has always wanted for Christmas. “A Christmas Story” will definitely have you laughing your way into the Christmas spirit. If it doesn’t, don’t fret, we still have two more films sure to put you in the Christmas spirit this holiday season! The last scene of this film will make you want to snuggle up in your warm bed and dream of the most wonderful time of the year, Christmas. Yes I’m serious!!! I love this movie! I watch it every year and only once during the season, so I never get sick of it! This was written by my favorite Director from the 80’s, John Hughes and boy is it a Christmas gem! Everyone relates to this film in one way or the other. Be it families fighting, struggling with the tree, over doing your lights outside or being stiffed by your Boss with a crappy bonus! We have all been through it and there is no other film that portrays the horrors of Christmas better than this film. 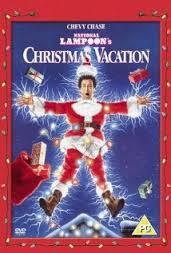 Then to top it all off, “National Lampoon’s Christmas Vacation” is funny as hell! I can go all day! If you haven’t seen this film then you are doing yourself a major disservice! Go out and rent it now! Actually it’s free on Netflix! What are you waiting for? Now it’s time to welcome in the holidays with some classic holiday comedy! This film is great for the whole family… well it has a couple of swears, but that’s about it. From beginning to end you will bust a gut as you watch Clark Griswold try to live up to his outrageous Christmas expectations. Then when you think it can’t get any funnier, good old Cousin Eddie comes to visit. And we can’t forget about senile Aunt Bethany. She is my favorite part of the film. So the Griswolds’ took a trip to Walley World in the first National Lampoon’s film and to Europe in the second. Now you get see what the Griswolds’ are like at home, celebrating Christmas. Audrey is played by the now famous Juliet Lewis and Rusty is no other that that kid from “Rosanne” and “The Big Bang Theory.” Sorry, don’t feel like looking up his name. Every Lampoon film they cast new kids for Audrey and Rusty, who never seem to grow up for some reason or they keep on having new ones and naming them the same. I love how they never really explain this in the films. Genius. Now I’m sure there are a lot of people scoffing at the fact this film is ranked above some true classics, but as foolish as “Christmas Vacation” can be, you can’t deny that great Christmas feeling you get at the end. John Hughes does it again, blending music, holiday activities and an explosive ending to catapult you into that needed Christmas spirit for this special day. The Description- The Griswolds are at it again as we open up on the family going to get their Christmas tree. As with everything else, of course Clark, the father, has to over do it by hiking out into the freezing wilderness and picking a tree that is way to big for his house. They finally find the perfect tree only to realize they forgot their saw. So, we cut to the next shot, which is a tree that has been ripped out of the ground and tied to the top of their station wagon. It all goes down hill from there as Clark Griswold takes his family on the Holiday ride of their life while trying to achieve the perfect Christmas. But a quirky family, rude stuck up neighbors, his low class cousin Eddie, Christmas lights that won’t light, a wrapped cat, a snotty dog, an over cooked turkey, a senile Aunt Bethany, cigar smoking Uncle Lewis and a bonus check that hasn’t arrived are all in his way as he tries to achieve this over zealous task. So get out that eggnog and load a plate full of Christmas treats because you are about to maximize that Christmas Spirit with this film. If the Griswolds can’t get you into the Christmas Spirit, then I have a huge task ahead of me. But don’t forget, I still have 3 more films to accomplish the task at hand. You will get into that Christmas Spirit even if I have to send three ghosts to visit you on Christmas Eve! Also, come take a stroll down by my site called “A Seat on a Train.” If you love the old classic “Twilight Zones” then you are sure to love “Out of Place” the first episode of “A Seat on a Train” at http://www.aseatonatrain.com Make my Christmas wish come true by watching my show. Merry Christmas! It’s hard not to think of “A Miracle on 34th Street” when you dream of this magical holiday. This film has been made over and over again. It’s been made for tv, for stage and even new versions released in the theaters but none of these remakes compare to the original. The original was so good that it was nominated for Best Picture by the Academy Awards. 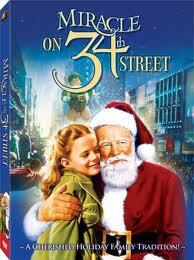 Even though it didn’t win, “A Miracle on 34th Street” won many other oscars including Best Supporting Actor, Best Original Story and Best Screenplay. So if you need to find a reason to watch this classic, I think the awards should be enough to convince. This magical story is nothing short of Holiday perfection. The plot, the classic style of filming and the actor playing Santa, Edmund Gwenn, is sure to put you in the holiday spirit. From the casting of the little girl, the famous Natalie Wood, to the scenes of Christmas at Macy’s, this film is all about this famous Holiday and stays on the subject all the way through. The Description- A man, who claims to be the real Santa Claus, is appalled by a drunk Santa working at Macys on 34th Street, Manhattan. He complains to the Event Director, Doris. She in turn has the drunk Santa fired but with no other Santa to take his place, she hires the man as the new Kris Kringle. But she soon begins to question this man’s sanity because he truly believes he is the real Santa. Later on, Doris’ daughter, Susan, goes to visit the Santa at Macy’s, ignoring specific instructions from her Mother. You see, Doris believes in not lying to her child and doesn’t think making up stories about Santa benefits Susan at all. Susan, who is a well trained young skeptic, questions her Mother’s lack of belief when she sees the Santa at Macy’s. She asks him a ton of questions which he answers all correctly. What truly convinces her is when she sees Santa talking to a girl, who doesn’t speak English, in Dutch. After hearing her daughter’s encounter, Doris begins questioning the man’s sanity and requests his termination, but Macy’s won’t fire him because he is so popular and has brought the store so much new business. But after Kris Kringle has a moment of violent anger over the greed of an executive, he is placed in a mental institution. With Christmas only days away, Santa goes to court and tries prove who he really is so he can deliver toys to all the kids on Christmas Eve. The gift he gives Susan and her mother will bring tears to your eyes and will be sure to get you into that Christmas Spirit. You will feel sorry for the little girl, Susan, who has no magic in her life and chooses to grow up so young. You will smile as you watch Santa try to convince others of his existence and tears will form in your eyes when you discover how he proves his identity. This film is a must see every Christmas and is definitely a film the whole family should watch together. I just can’t wrap my brain around this one! I just don’t understand why this film fell through the cracks! It’s nothing short of magical and has such a warm, beautiful message at the end. They play it every year on t.v. but most people I talk to haven’t seen it. Now, don’t get this one confused with “The Preacher’s Wife,” starring a young Whitney Houston and Denzel Washington. 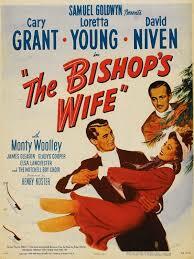 “The Preacher’s Wife” is a modern adaptation of “The Bishop’s Wife” and does not compare to this film one bit. I just can’t understand why they won’t leave the classics alone. This film is perfect in every which way and has definitely survived the times to secure itself a spot on the Christmas Classics list. So, if nothing comes of my top ten list at least I got a few people to watch this beautiful film. I myself didn’t see it until a few years ago, so don’t feel guilty if you missed it. Cary Grant is perfectly picked as the angel, along with Loretta Young and David Niven to make an all star cast. If you want to get your kids and family into the old black and white films, Christmas is the perfect time to mold their brains. My love for the older music and films came while celebrating Christmas. After falling in love with Bing Crosby’s, Frank Sinatra’s and Burl Ives’ Christmas songs, I ended up opening my ears to the older music. 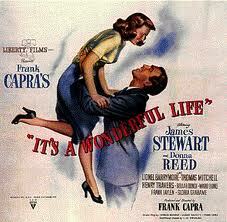 Then I saw “It’s a Wonderful Life” and was hooked on classic films as well. Christmas is one of those rare times of year where we welcome the classics and blend them with the modern. Christmas is a time of reminiscing and thinking about the Christmas’s long ago. This nostalgic holiday is the perfect time for recognizing old traditions and making new ones to practice for years to come. The classic movies and music, show their true talent during this season and make new young fans every year. So, if you want to open your family’s eyes to great black and white films, start here. “The Bishop’s Wife” will catapult you into the Christmas spirit with the sound of sleigh bells, that classic film quality and a beautiful, simple story about an angel named Dudley. The Description- A Bishop named Henry prays for help getting his town’s Cathedral built. An angel named Dudley soon responds and is only known to be an angel by the Clergy men. How can you not want to see this film? The plot is so rich and genius. It’s the perfect scenario for a Christmas film and let me tell you, they execute it perfectly. You will be glued to the tv wondering how the drama will play out while, in the meantime, enjoying holiday spirit lifting scenes. 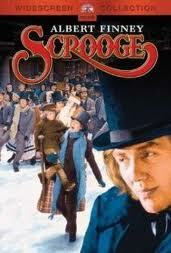 We need to revive this film and make it a Christmas classic watched by all once again. “The Bishop’s Wife” is one of those rare films that perfectly blends tradition with a warm Christmas message. This film is sure to make your family thirst for more black and white films in the future. 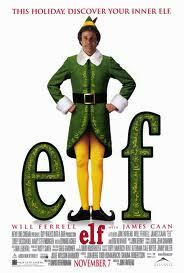 “Elf” is the perfect film to put you in the Christmas spirit because you feel like a kid again watching it, especially the 1st hour. What they have done here is combine the magic of Christmas and blended it with adult humor and hilarious scenes. This original take on Christmas is great to watch with the older, more mature family but most young kids will enjoy it and the crude jokes will fly right over their heads. Even if you don’t particularly like him, Wil Farrel is amazing as Buddy. He is perfectly cast and his portrayal of a naive, human Elf is nothing short of genius. Let me tell you, it’s not easy to break into the Christmas Classic Movie Genre. The films in this group are an elite few and “Elf” is very close to securing a spot, if it hasn’t already. I have just recently added this film to my must watch list every year. I feel the first half of the film is way better than the conclusion, but not everything is perfect. That’s why “Elf” scored so low in this category. “Elf” will have you laughing from the beginning and will leave you with a warm, Christmas feeling at the end. Now the ending is kind of cheesy and hard to buy, but the comedy, plot and message make up for any weak points this film has. So sit back and prepare to feel like a kid again as you travel to the North Pole with the warm nostalgic sound of Bob Newhart’s voice narrating. If you haven’t seen this one yet, then you are in for a real Christmas treat. The Decription- A naive Elf named Buddy lives at the North Pole. He believes he is an Elf but doesn’t fit in with the others due to his size. After realizing he is human and is of no use to Santa because he is so large, he travels to New York City to find his Father (Walter Hobbs) who doesn’t even know he exists. Soon after arriving in New York City he tracks down Walter, who runs a Children’s Book publishing company. After his Father denies him, Buddy goes to work in a department store but is soon fired for fighting with the fake Santa. Realizing Buddy is his son, Walter decides to take him in to his own home, where the out of touch Buddy wins over his son (Miachael’s) heart with his huge, naive Christmas spirit. Buddy and Michael soon find themselves in Central Park trying to help Santa fix his broken sleigh. They all realize the only way they can save Christmas is to get people to believe in the holiday spirit which will get Santa’s sleigh flying again. Wow, that’s a hard movie to sum up in a few words… If you want to see a totally original take on Christmas through a hilarious Elf’s eyes, this is the perfect film for you. You will laugh your but off watching Buddy try to adjust to the Manhattan lifestyle and will get a nice warm feeling when Christmas is saved once again at the end. So get out the eggnog and the Christmas snacks because you are in for a real treat. Just don’t drink and eat too much because you are sure to bust a gut watching this hilarious, soon to be Holiday Classic. Also, if you love “The Twilight Zone” then why not come take “A Seat on a Train” at http://www.aseatontrain.com I know you don’t know me but give me a Christmas gift by watching my first episode “Out of Place” and of course, have a Happy Holiday.